We’re at it again, Thanksgiving is upon us and if pumpkin pie is what you’re after, you’ve come to the right place. 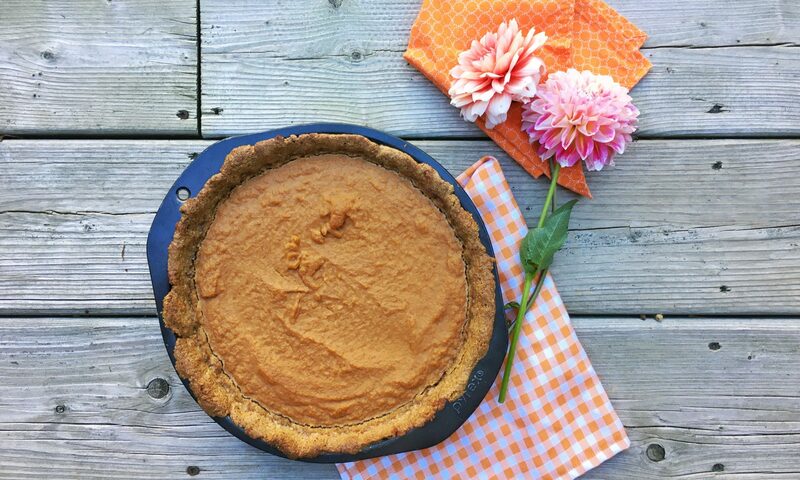 If you follow along on instagram you’ll know that I posted a picture of a grain-free pumpkin pie, with a recipe to follow, if it tasted as good as it looked. Well, it tasted amazing, and got rave reviews from everyone at the table, so here is the recipe. The beauty of this recipe, is you don’t have to worry about rolling out the dough, you just use your hands to press it into the pie plate, this is a perfect job for your kids to help you with! Plus, you can feel great about eating this pie, as it has no refined sugar and very little sugar all in all, and its high in vitamin A and fibre, thanks to the delicious pumpkin. Its also dairy free, gluten free, and (obvi!) grain free! In a food processor, combine your nuts and hemp hearts. Pulse until they become a flour-like, grainy consistency. Add in your almond flour and spices, pulse to combine. Add your coconut oil and pulse just until everything sticks together and looks like a loose pie crust. Using your hands, press the dough into a 8 or 9 inch pie plate, spreading it up the sides and bottom of the pie plate, ensure its a even consistency. Using a fork, prick the pie crust to allow air to escape and avoid air bubbles during baking. Bake at 325ºF for 10-15 minutes or until lightly golden. Remove from oven and let cool fully. Meanwhile, whisk together all of the ingredients of your pumpkin pie filling. Once pie crust is fully cooled, pour your filling into the crust. Bake at 350ºF for 30-40 minutes or until the custard is mostly firm and a little jiggly in the centre. Let cool before serving. Serve with coconut whipped cream for a delicious dessert! Yum! Yum! This tastes even better the next day!